I have enjoyed our Sahara desert trip immensely. The journey took us through the proudly standing sand dunes of Erg Chigaga, Morocco. An array of small to big sand mountains reaching as far as our eye can see. The solitude of the trek was very relaxing and calming. It was a great mediation to think of nothing and become the center of the Universe. I followed the footsteps of my guide and his blue veil and blue djellaba leading our camels. He was a local Nomad boy that grew up in this forsaken region and seemed like he knew every sand dune, every curve of the desert. Our camels were strong, beautiful and smelly. I suddenly had a great appreciation for these animals. They walk so gently; in slow pace rocking from one side to other. Without any complain they carry loads of heavy equipment, supplies and our food. As gratitude, I had fed them peels of my orange and carrots out of my cous cous. I enjoyed the evenings so much, when the sun started setting down and temperature cool of. The desert at that time became like one flame of red color. All was red before the black pitch night with million of stars, strong and bright covered the night sky. I have never seen so many shooting starts, now I hope that all my wishes will come true! At night our guide made campfire and prepared delicious diner for us. We have even baked our own bread in the sand. We passed the time before heading to sleep by listening to his singing and drumming, by talking about life, his, ours. The stories told will be remembered. One night a small group of local Nomads joined us. These people are the only people you might encounter on your journey though the Sahara desert. Their herds of animals and children look at your with interest. Their nomadic life might seem romantic and they greatly appreciate the help one another. I love adventure and have explored our Earth a bit. I have ski in the Alps, climbed the Kilimanjaro mountain, dived in the Great Barrier reef, followed the road to Machu Pichu and I am proud to say that trekking of the Sahara Desert was so different to all these and so unique. It someway helps you reflect to your inner I. 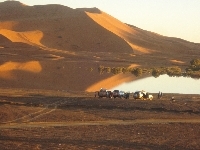 Thank you Your Morocco Tour, for organizing this wonderful Sahara desert trip for us. Thank you to our guide Zed and Abdu for being there for us. My rule is not to return to places I have been, but the Sahara desert might be an exception and we will be back. Did you enjoy Sahara Desert Camel Trek Holiday Morocco and have you been on a holiday in Mhamid, Morocco?